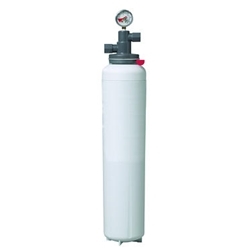 3M™ Water Filtration Products Models ICE160-S and ICE165-S single cartridge water ﬁltration systems help provide consistent high quality water for commercial ice by reducing the effects of sediment and chlorine taste and odor at ﬂow rates up to 5.00 gpm (18.9 lpm). Built-in scale inhibition reduces the ability of calcium and magnesium to precipitate on the evaporator plates as hard scale. and sediment reduction, while reducing the effects of chlorine corrosion and scale for up to 54,000 gallons (204,412 liters). • ICE195-S combines chlorine taste and odor reduction with sediment reduction from higher turbidity water, while reducing the effects of chlorine corrosion and scale for up to 54,000 gallons (204,412 liters). • Effectively reduces sediment and chlorine taste and odor for better equipment protection and clearer, great tasting ice. • Revolutionary Integrated Membrane Pre-Activated Carbon Technology (“IMPACT”) dual-zone media cartridge construction combines a membrane in series with premium activated carbon to provide superior throughput and cartridge life. • Certiﬁed by NSF to Standard 53 for cyst reduction (HF90-S replacement cartridge). • NSF Standard 42 and/or FDA CFR-21 compliant materials. • Reduction of up to 99.99% of common water-borne heterotrophic bacteria by membrane ﬁ ltration as tested by CUNO (HF60-S replacement cartridge). • Built-in scale inhibitor reduces lime scale build-up on evaporator plates as tested by CUNO. • Sanitary Quick Change (SQC) encapsulated cartridge design allows for fast and easy cartridge change-outs with a 1/4 turn. • 1/2” FNPT horizontal inlet and outlet ports allow direct or easily adaptable connections to existing plumbing lines.